SCUBA IS AN EQUIPMENT INTENSIVE SPORT; you can't go diving without it. But not everyone makes the decision to own all their own gear (at least not right away). Renting for the occasional trip makes sense. Many customers simply want to "try it before they buy it." Our rental equipment is immaculately maintained; in as close to "as new" condition as humanly possible. You can reserve the rental equipment you need, to ensure it will be there for you, even during busy weekends and holidays. If you are renting for a shop sponsored event or trip, it's half price for the rental equipment. Planning to purchase your own equipment in the future? Be sure to ask about our rental reimbursement program. Weekend rentals are from Friday afternoon until Monday before the close of business. Weekly rates cover 10 days (Friday afternoon to Monday). All other rentals are based on a 24-hour period. 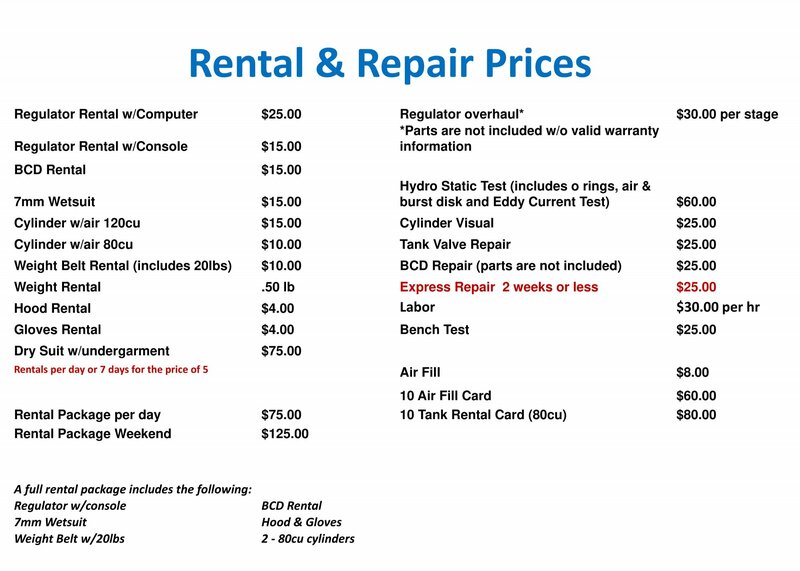 Cylinder rentals include air fills. All rentals require a security deposit in the form of a signed, open credit-card slip or cash equal to the value of the equipment rented. Renters must provide positive identification in the form of a current driver’s license and a valid scuba certification card. All rental items must be returned clean, or cleaning charges will apply.